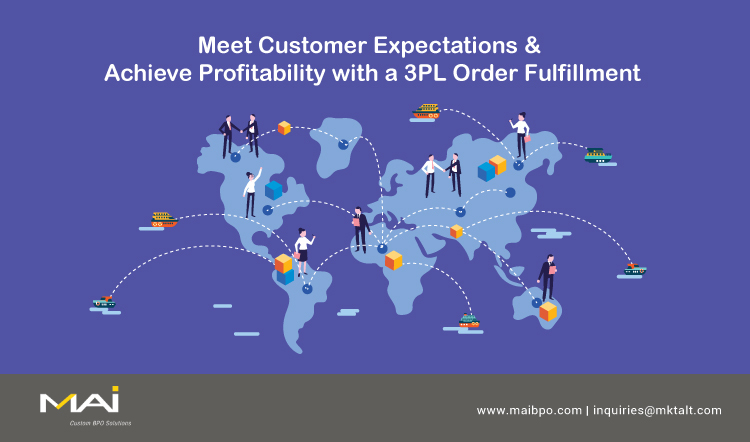 A 3PL or Third-party Logistics (3PL) provider takes care of end-to-end order fulfillment beginning from managing your inventory in warehouses, systematically managing incoming orders, and picking and packing goods to delivering the goods until customer doorstep. In other words, 3PL providers take care of the most complicated and strenuous part of order fulfillment. So, if you are a small business that has space constraints or a huge business with large volumes of orders, a 3PL provider can simplify order fulfillment for your business. They also provideseveral additional benefits - from reducing inventory shortage to improving your bottom line. Global shipping rates have a mind of their own. They fluctuate based on fuel prices and market forces of demand and supply. That could spell trouble for eCommerce players who want to have some kind of stability in shipping costs. Such a stability would help them maintain their profitability per order. A 3PL provider can help attain more stable shipping costs by arriving at bulk shipping rates based on periodical or quantitative calculations. For instance, retailers can engage 3PL providers for a flat shipping rate for various volumes of inventory or number of orders transacted. This would, in turn, result in long-term cost efficiencies. When it comes to outsourcing a critical function, the first question that takes form in any business owner’s mind is the scalability. The complexity of the function, the level of control required and the personalization demands of customers all make scalability in outsourcing a doubtful possibility. When it comes to logistics outsourcing to a 3PL, it is proven that it can be scaled seamlessly across all regions irrespective of national and international geographies. 3PL players usually have a large footprint of carrier networks, distribution centers, administrative offices and the necessary infrastructure required to pick, pack and ship packages to any distant customer location. Customers want real-time tracking of their packages. They want to know when the package was shipped, when it was dispatched for delivery and how long before it reaches their hands. This need for on-demand information has become a difficult challenge for retailers. Integrating the 3PL’s order fulfillment system with your sales channel can help surmount that challenge. 3PL providers have high-end delivery tracking systems that can address all of customer queries relating to delivery statuses to estimated time of arrival. Outsourcing the order fulfillment process to a 3PL can bring transparency to the delivery process. Be it raw materials or finished goods, inventory is the single most asset that can influence profitability for your business. A third party logistics player will bring to the table the diverse experience of handling inventory belonging to various industries. They will help tweak inventory management at each point of the supply chain. Further, they use Warehouse Management Systems which give a real-time pulse of the inventory level as well as aid in forecasting of requirements in the near future. Ultimately, involving a 3PL will result in efficient inventory management which will pave way to better profitability. For faster deliveries, especially on-demand, your business would need distribution centers that are located as close to customers as possible. For an eCommerce business, renting/leasing warehouses in every major urban center or suburban location would prove to be an expensive affair. The ROI on such an exercise would also be negative if the order volumes are not adequate enough. In such a scenario, the wide shipping zone of a 3PL provider is a game changer. They help serve customers located in far-flung places quickly in an affordable manner. In a way, 3PL provider will help you expand your geographical footprint strategically without the need to lease warehouses and maintain them when order volumes are fluctuating. Logistics and eCommerce churn out tons of data, which if analyzed, will help pick out insights that can steer the order fulfillment process in the right direction. According to the 2018 22nd Annual Third-Party Logistics (3PL) Study (Signup required), 86% of 3PLs surveyed said that using big data effectively will become “a core competency of their supply chain organizations”. Big Data, Business Intelligence and Analytics are not low hanging fruits that retailers can reach for easily. They need the support of 3PL providers to infuse the analytical edge into the logistics operations. The data-driven supply chain management would help deduce new route patterns, rush hours, order patterns and much more. Whether to achieve cost savings or to streamline your order fulfillment process, 3PL providers can be excellent partners for eCommerce businesses. They can help take away the complexity of managing incoming orders and connecting supply chain systems as well as leverage the power of technology to achieve long-term supply chain efficiency.